The definition of workers is constantly evolving. The notion of an “intermediate”, hybrid employee or “dependent contractor” has gained much traction not only to describe Canadians participating in the “gig” economy, particularly millennials, but also those occupying more traditional work relationships. This webinar will take a look at the legal evolution when it comes to dependent contractors, and what employers need to know and look out for. Understanding, identifying and mitigating potential harassment problems. Understanding the financial and reputation risks in harassment cases today. Acting quickly and decisively as a Risk Manager. Your toolkit to respond effectively and confidently with little risk to you. Beginning October 17th, this certificate program co-directed by Natalie C. MacDonald will delve into the most challenging issues in workplace law using an in-depth case study method. Firing an employee is a difficult and emotionally charged event. Done wrong, and you are faced with a costly legal case, reputational damage and adverse effects on employee morale. Natalie MacDonald leads this live online course on October 23rd. Natalie will be presenting at INFONEX’s Risk Management in the Public Sector in Ottawa, January 22 & 23, 2019. On Friday, September 21st, Natalie MacDonald will present at The Advocates’ Society’s new education program, Employment Litigation Advocacy. Her panel, Employment Pleadings: Top Tips will be from 9:05 a.m. to 9:40 a.m.
From August 26th – 30th, Natalie will be speaking at the International Women’s Economic Forum in South Africa in where she will speak on human rights. The Unfettered Right to Dismiss an Employee – Implications of the Ontario Court of Appeal’s recent decision: Mohamed v. Information Systems Architects Inc. The Ontario Court of Appeal released its decision in Mohamed v. Information Systems Architects Inc., 2010 ONCA 248 on May 7, 2018. While some were quick to argue that an employer’s unfettered right to terminate has been compromised, the Ontario Court of Appeal’s ruling has much wider implications, and adds some spark to the employee-focused landscape of 2017/2018. Join Natalie MacDonald this Wednesday, June 27, 2018 for an interactive webinar to answer your questions relating to employer and employee rights and responsibilities when it comes to termination. Register Now. Submit your questions during the session, or in advance by emailing us. The most successful workplaces are those built on open, honest communication between employer and employee. They are guided by principles of fairness and reasonable standards applied by both parties. Too often these concepts are forgotten, whilst concerns of potential litigation guide the way. Join Natalie MacDonald on Wednesday, May 30, 2018 for an interactive webinar to answer your questions relating to basic concepts in performance management throughout the employment relationship. Submit your questions during the session, or in advance by emailing us. Natalie C. MacDonald and Associate Tara Vasdani have been nominated in Canadian Lawyer’s Top 25 Influential Lawyers of 2018. 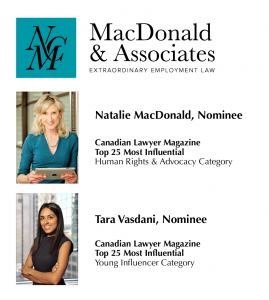 Founder Natalie C. MacDonald has been nominated in the Human Rights, Advocacy and Criminal category, and Associate Tara Vasdani in the Young Influencer category. Voting is open until May 22, 2018. On April 12th, Associates Kathryn Marshall and Tara Vasdani will attend a Shelter Movers Toronto event in support of the vital services it offers to women and their children fleeing abuse. After months of speculation and consultations, the Federal government announced in April their firm intention and legislation plan to legalize recreational marijuana use by July 1, 2018. Join Natalie MacDonald on Wednesday, March 28th, 2018 for an interactive session to have your questions answered regarding medical marijuana and the legalization of it, and how it will impact your workplace. Register now, and submit your questions during the session, or in advance by emailing us. On March 19 and 22, Natalie is participating in a webinar for the Ontario Association of Cemetery and Funeral Professionals. The topic of Natalie’s session is: Don’t Let Smoke Get In Your Eyes: Know How to Navigate Weed in the Workplace. Natalie will be speaking at the OBA’s 16th Annual Current Issues in Employment Law program being held on Friday, April 27, 2018, from 9:00 a.m. to 4:30 p.m. at Twenty Toronto Street Conferences and Events (OBA Conference Centre). From Wood v. Deeley’s pronouncements on termination clauses, to the wave of Employment Standards changes from Bill 148, 2017 has been a busy year for employment law. The year ended on an even higher note with the release of Justice Emery’s leading decision on punitive damages and moral damages in employment law, Galea v. Wal-Mart, accompanied by one of the highest damage awards ever in these areas. Join MacDonald & Associates for a webinar on Wednesday, January 24th, 2018 as we review Galea, its implications, and the landscape that 2017’s key legal developments have left behind, as we prepare for another busy year in the employment law world. On November 22, 2017, the Ontario Legislature passed Bill 148, the Fair Workplaces, Better Jobs Act. Once enacted on January 1, 2018, Bill 148 will change major aspects of the Employment Standards Act, 2000, the Labour Relations Act, and the Occupational Health and Safety Act. The changes contained in Bill 148 are the most substantial amendments to employment and labour law in Ontario in decades and will have far-reaching implications. Most people’s knowledge of Bill 148 is limited to its impact on increasing the minimum wage in Ontario. Join Natalie C. MacDonald and Geoffrey Lowe on Wednesday, December 6th at 11am for a comprehensive overview of all the changes Bill 148 will make to the Employment Standards Act, 2000, including the new leaves of absence, the new rules about scheduling employees, and yes, the changes to the minimum wage in Ontario. Natalie will be speaking at OBA’s Expert Strategies for Trial Preparation on Friday, November 24, 2017, 9:00am – 12:30pm at Twenty Toronto Street Conferences and Events (OBA Conference Centre). Legalization of recreational marijuana use is fast approaching, and will have big impacts on all workplaces in Canada. Join MacDonald & Associates for our first-ever free Webinar on November 2, 2017. Learn what employees need to know to ensure they will not run into trouble at work for their marijuana use, and the policies and procedures employers need to know to follow the law, accommodating any employees in need, and still protecting their workforce and business interests. Natalie was invited to speak at the International Women’s Economic Forum in Iceland on October 19-20th, 2017. The former Prime Minister of Iceland will be speaking, along with Natalie and other people who were selected amongst the top in the world to speak on the subject of gender equality. On Thursday October 12, 2017, Natalie C. MacDonald appears on the Ontario Bar Association’s Panel for Successful Female Lawyers.